You guys are so lucky, you get to see my trusty yellow cardigan two weeks in a row. And, like I mentioned before, it actually has a burned hole in the sleeve (from a fireplace) so I roll the sleeves. I like to admit things like that to the internet. I'm klassy like that. And also, I can't find a good replacement, so if you ever come across a short-sleeve mustard sweater, let me know. I'm continuing to push the limits on my non-maternity shirts. Sometimes I put on a shirt in the morning and it makes me laugh a lot. Kind of like squeezing a soccer ball into a tube sock. Not cute, but really funny. This sleeveless button-down probably won't be worn again (unless it's underneath a shirt that actually fits) but I am trying so hard to wear as much as I can before I get huge. Don't worry - I will be posting pictures of my enormous self on the internet too. I have no boundaries. Love it! I'm glad you're working to stretch normal clothes as long as you can! Aren't you glad for maternity jeans, though? Ahhh so comfy! Also, I saw a mustard boyfriend cardigan at Walmart today for just under $13. I think it was either 3/4 or long sleeve. I need to go check out the one at Wal-Mart for sure! I like the JCP one... It does look a little thin though. I think I just want the perfect replacement for my F21 and I need to let it go and try something else hah! 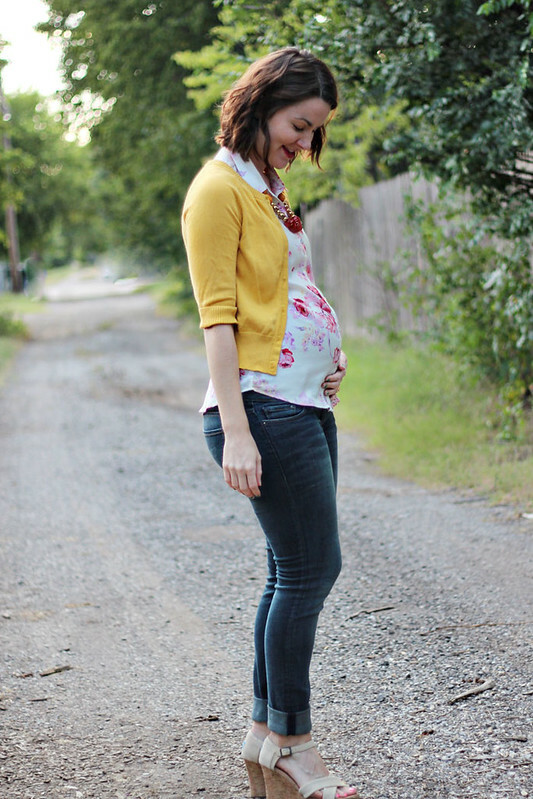 Best mustard cardigan ever from Modcloth. Worth the money. Order a size up. I am a cheapie but this one is worth it. Great look! I love this on you. 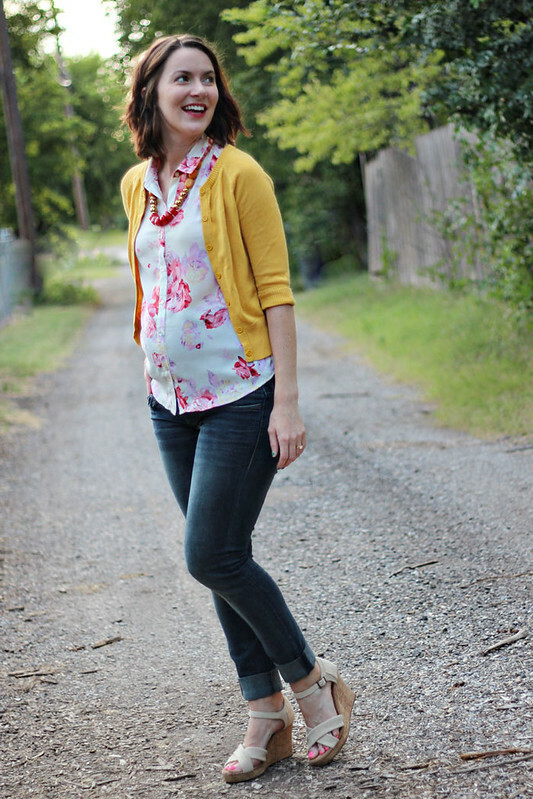 The rose print looks vintage, as does the mustard cardigan. I love this kind of look together Your jeans are a great fit as well. What a cute blouse! I love it with the yellow cardigan! Aw, thanks so much Whitney! Mustard seriously is the best color. I am definitely pushing the limit on a lot of my clothes right now... I really need to just buy some maternity shirts, haha! I curl my hair with a small curling iron. I WISH I had wavy hair, but my hair is thick so it holds a natural wave really well. I usually curl it and the waves will last for at least 4 days. I think these pictures were taken on day 4. Maybe I'll do a post about how I do my hair soon! You look glowing! Your bump is so cute. I like the mustard on top of the floral blouse. You look adorable! I love how you styled this outfit. 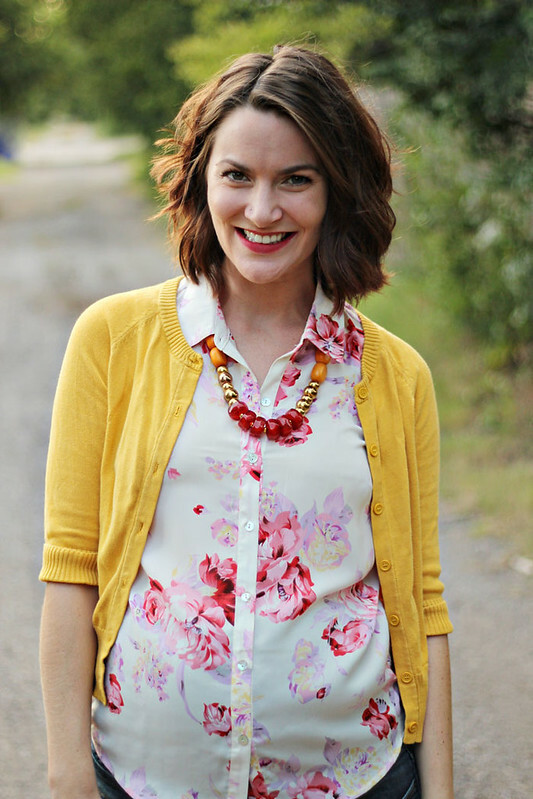 I really like the combination of mustard yellow sweater and stretched-tight adorable floral button up. You look so cute. Yay for heels and pregnancy bellies! You are so cute! 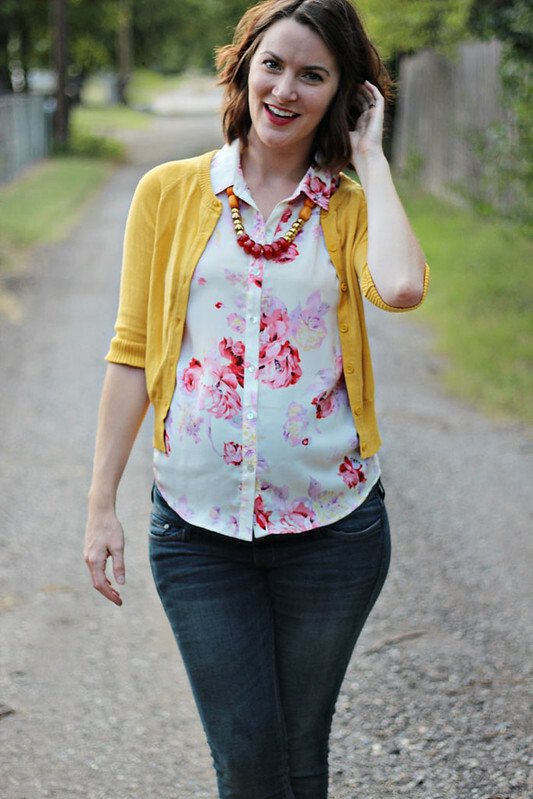 I love the florals and the yellow sweater together! I hope your week is going well! I think it's totally cute! Plus you might as well get as much wear out of it as possible. Haha I was the same way with shirts...even my oversized tshirts are getting way too tight. Oops. I love that floral top! It's great that you can get a few more wears out of your regular wardrobe! Love the color combo of this outfit! 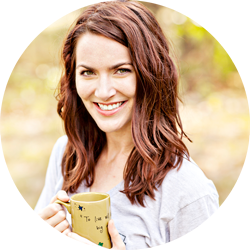 You have the pregnancy glow and look great! Always a pleasure stopping by. Welcome by to see my latest. That floral top is beyond gorgeous!! Soccer ball into a tube sock is a great analogy. I'll have remember that one. I told my mom the other day that a big dude in a too-fitted blazer looks a lot like a sausage link; I think your soccer ball in a tube sock analogy is much kinder to pregnant women. Also, what if you wore a tank under this shirt and just left it unbuttoned? I know it won't be that warm for that much longer, but just a thought that could also apply to long-sleeved button-up shirts as well. Have you seen those tutorials on how to turn scarves into vests? Those are pretty awesome and probably a great way for lovely ladies in your position who would like to make the most of her wardrobe without buying a bunch more maternity pieces. ANYWAY, I reeeeally love the colors of this top. So very much. Pink and mustard look great together. I think this is a color combination I need to remember. You ALWAYS look adorable but your little bump just adds to your adorableness. I really love the color combination in this outfit!